Before departure we welcomed two day riders and two new longer-term riders into the team and played group games at the meeting point by the central station whilst Marie replaced her bike rack. Münster is a very bike-friendly city so it was comfortable riding out of it. Nevertheless conditions were tricky in terms of the biting cold wind. If it hadn´t been for timely rounds of ninja and penguin-pogo during breaks and on the road sing-alongs lead by Phil’s enthusiasm, it would have been the time for our spirits to drop. 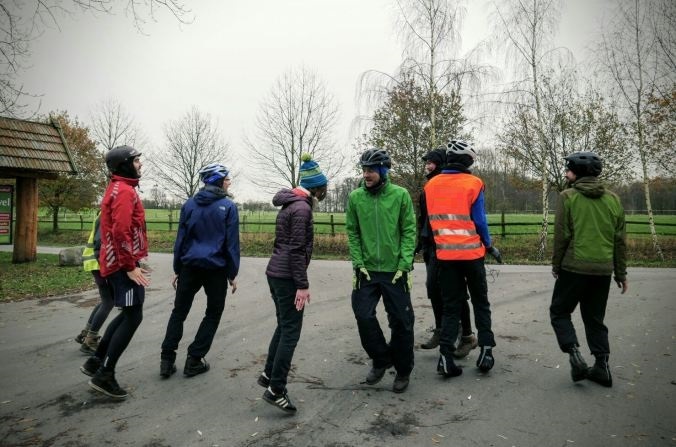 “What´s penguin-pogo?” we hear you ask… Well, imagine all of us in full winter cycling gear and helmets, with arms tightly pressed to bodies, hands stretched out horizontally, hopping around and bumping into each other clumsily like a benign mosh pit. Lunch was kindly organized by a local Friends of the Earth group in Lüdinghausen, who were very thoughtful in preparing hot vegetable soup, bread, cheese, coffee, cookies, warm apple juice and apples from their community orchard. It was a delight to have a hot meal waiting, for sure, nevertheless all was served outdoors and given the weather conditions this was rather uncomfortable because of the cold. Therese´s energy came to the rescue at this point, as she led her best and craziest warm up routine yet. The landscape and road layout changed drastically after lunch. We waved goodbye to fields and country roads with parallel bike lanes, this afternoon felt more like a never ending urban sprawl dotted with industrial parks. Lots of trucks on the road, tram-lines and bumpy bike lanes didn´t increase the wholesomeness. We arrived in Bochum just after 4pm and went directly to the sustainability fair organized by Arbeitskreis Umweltschutz Bochum inside the town´s Volkshochschule. A handful of environmental NGOs, initiatives and enterprises had set up information stands. We were welcomed like heroes, which was both flattering and weird at the same time. The small crowd gave us warm applause as we entered carrying our bags, faces red and cold. After short presentations from most of the groups represented, The Captain said a few words about Cooperide. We enjoyed a snack buffet with fair trade and organic treats (and many of those famous German spreads) and we were able to set up our banner and posters in a stand of our own so that people could approach us with questions and support us with donations. After the event, the organisers escorted us to our accommodation in a short but high energy and loud critical mass. PD: As we bike through small towns and villages in the afternoon we often see people walking their dogs (particularly after lunch or in the evening). We have noticed that the dogs seem to take more interest in us than their owners. How surprised and happy they are!